Appearances can be deceiving. Courtyard looks (and is priced as) a gimped Smithy, effectively only drawing 2 cards instead of 3. In reality, the top-decking effect makes Courtyard a far stronger card than Smithy, at least when you aren’t actually looking to draw your deck. It means any Actions that you draw dead can be placed back on top of your deck, and any incomplete combos (like Fool’s Gold) can be placed back to be drawn another day. In a single-Action game, where you’ll only have a single terminal Action and several nonterminal Actions, Courtyard is far preferable to Smithy. In many ways, Courtyard is like Haven. It smooths your turns and assists your combos so that you can draw $8 and $8 instead of $7 and $9. Multiple Courtyards are much less useful than multiple Havens, but Courtyard makes up for its terminal-ness by drawing you to a 7 card hand first. In other words, Courtyard tends to lend itself to Big Money, while Haven lends itself to engines. This is borne out by simulator results, where Courtyard is one of the premier Big Money enablers (along with Wharf and Jack of All Trades). Where Courtyard really excels is when you run a predominantly Big Money deck that has a few combo pieces in it. Tournament, Baron, Fool’s Gold, etc. are all very strong additions to a Big Money-Courtyard deck. Paradoxically, where Courtyard is least effective is when you actually try to use it at a Smithy. Here, you’ll just find yourself re-drawing that top-decked card over and over again, and you’re really just drawing 2 cards at a time. The point of Courtyard is not actually to draw +3 Cards; it’s the deck rearrangement and handsize increase that makes it such a strong card. This entry was posted in Intrigue and tagged courtyard. Bookmark the permalink. I actually group courtyard with Embassy, and to a lesser degree, Warehouse. And Courtyard+power-terminal is never really going to draw the other terminal dead, barring reshuffle timings. Courtyard is extremely good in engines that care about diversity (e.g. menage) and in engine setups that care about top deck composition (e.g. outpost/anything engines, harvest based strategies). 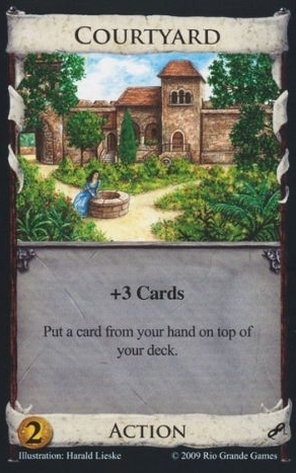 Yes it only increases hand size for the cost of one action, but it can let you change both what is in your hand so you fire off a menage or a shanty town and what is on top deck so you safely play NV for “trashing” or skip an estate with a farming village. For a subset of engines, this is very powerful. In an Alchemist game, Courtyard/Potion consistently outperforms Silver/Potion. This is interesting. I just did some basic simulations of opening Courtyard/Potion versus Silver/Potion in terms of the likelihood of hitting 3P (to purchase an Alchemist or a Familiar, for example) before the second reshuffle. What I found may be somewhat surprising: Silver/Potion gives a 65% chance of hitting it, but Courtyard/Potion gives an only *slightly* higher 66% chance. I attribute this to the fact that although drawing and playing Courtyard on turn 3 all-but-guarantees the 3P before the second reshuffle, drawing and playing Courtyard on turn 4 triggers the second reshuffle prematurely. It’s not just the initial chance of getting Alchemist that matters though. Courtyard is excellent for consistently finding that Potion for $3P, while ensuring that your Alchemists get in play and stay there. If you have a Courtyard, you should never need a second Potion (huge benefit) but will still have a much easier time keeping your Alchemist chain running. “When you play Mandarin, you get +$3 and put a card from your hand on your deck – the money version of Courtyard. It costs a lot more than Courtyard and well there’s a lesson there for all of us.” That’s what Donald X. said about the Mandarin and it says just as much about courtyard. In fact, Intrigue has really weakened the basis Smithy with Courtyard, Torturer and Nobles ! Courtyard is good for saving terminals and comboes, so it is a “soft” way, and Smithy an “hard” one when you know what you do. I like the article, because it points out how good this card is in BigMoney variants, and also very clearly why. I don’t quite agree it conflicts with engines. Just make sure it isn’t your main / only card draw. If I decide to build an engine, and courtyard is on the table, I almost always open with it. For exactly the same reason this card is good in BigMoney, it helps kickstarting the engine. I can probably skip buying (at least one of) those annoying silvers that I otherwise just have to open with and get in the way later. And once the engine really gets going, this can sort of function as scheme. Putting a village, a moat, a bane card or a hunting party on there can really smooth things out. Say we are using menagerie. A lot of times you pair menagerie with a discard-for-benefit card, to get rid of doubles like copper you don’t want. But what if you’ve bought, say, two golds? Courtyard lets you get it out of your hand but still keep it, and have +2 cards. You bought a lookout for early trashing but now your deck is mostly stuff you want. Put a card you want to trash back on top, use lookout. These both require + action and don’t come up that often, but they’re things to look out for. The primary reasons to use courtyard are in Stef’s post. I rarely buy Treasure map as it is the terminal-est of all terminals, but I’ll consider it with Courtyard as I would Haven or Warehouse. Early in the game with a small deck, using Courtyard to put Treasure Map back on top greatly increases your chances of scoring the maps together in your next draw. And since Courtyard works with Big Money, the synergies continue after that. I don’t think Treasure Map is really worth it with CY. With just Courtyards and Silver, you can buy a Gold practically every time you play CY. I think you will generally get to 4 Golds faster just by buying them than by trying to get them via Treasure Maps. There are some minor combos with Courtyard that let you skip over a victory/curse card you put back: Venture, Farming Village. That’s a good point. I keep thinking about setting aside a copper if I have 7 coins in my hand, or something to that effect. but a dead action card works well also.